Sometimes you see a movie and, even though everyone hates it, you seem to be okay with it. In 1997, I came out of The Lost World: Jurassic Park thinking it was a superior film than its 1993 predecessor. I recently saw it again for my Jurassic Park post, and boy, was I wrong. Then there’s 2003’s film Daredevil, which I found quite entertaining twelve years ago, but which I’m told is utter garbage. I’m pretty sure my peeps are right, so I’ll have to revisit it sometime. In any case, I had heard that Netflix’s new series about Marvel’s superhero was a “must-see,” so I gave it a shot. I’m particularly difficult when it comes to comic book stuff. Too silly and over-the-top and I’m out – think Thor (2011). Too serious and bombastic, I’m out – think Man of Steel (2013). Strike the right balance, such as with most of the X-Men franchise, Captain America: The Winter Soldier (2014), or Joss Whedon’s take on The Avengers (2012-2015), and I’m all in. Daredevil is neither here nor there. It’s basically an origin story about how a righteous blind lawyer named Matt Murdock (Charlie Cox) becomes Batman, um, I mean, a masked vigilante. But in general I felt its overall tone was too somber and ponderous – there’s only so many discussions about city corruption or guilt-ridden confession scenes inside a church I can take. It also suffers from weak dialogue and weaker acting, something that starts to stand out over thirteen episodes. Then again, there’s some really good stuff here, such as nifty action choreography and a couple of surprising character deaths I didn’t see coming. 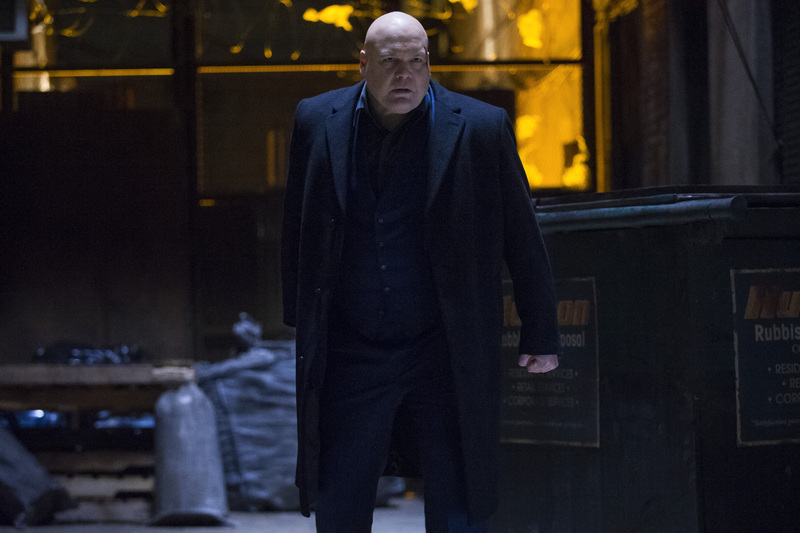 Plus there’s Vincent D’Onofrio as top villain Wilson Fisk, a tightly wound ball of anger whose imposing physique and violent unpredictability makes for a terrifying foe. D’Onofrio imbues his performance with an emotionally vulnerable edge which is a treat to watch. So this Daredevil is a mixed bag. Fast forward to the action sequences and any scene with D’Onofrio, and definitely check out episode seven, Stick, with Scott Glenn playing the blind sensei that trains Matt as a child. Had the whole series been as exciting as that hour, I would’ve definitely been on board for the next season. But as it stands, I think I’ll wait until Elektra shows up. For us mere mortals this series is nothing short of excellent. Frank Miller in particular must be proud since the whole ambience, style and (dare I use the word) “gritiness” practically reeks (in a good way) of his work on the Daredevil comic book. This is “serious, somber and grim” done right. Done because the story demands it, not done because desaturated, unnecessrily gloomy hero stuff is “in”. So I’ve been highly recommending this to anyone withing hearing distance and I anxiously await the second season of this very well done comic book to tv series adaptation. I agree with Carlos, but I have to see season 2! I hope it gets better! I’m starting to like the characters so let’s see!